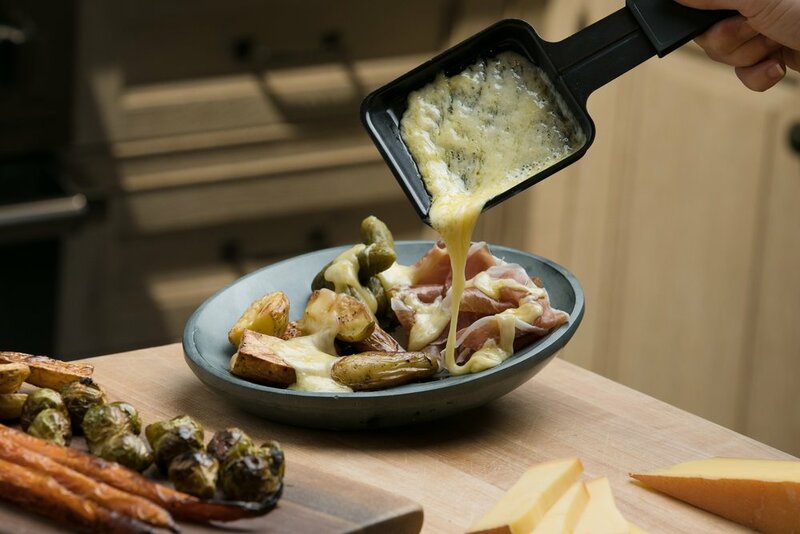 If you don't have a raclette machine, you can easily melt your Reading in a skillet on the stove over low-ish heat. 1. Rub inside of fondue pot with halved garlic clove. Discard garlic after use. 2. 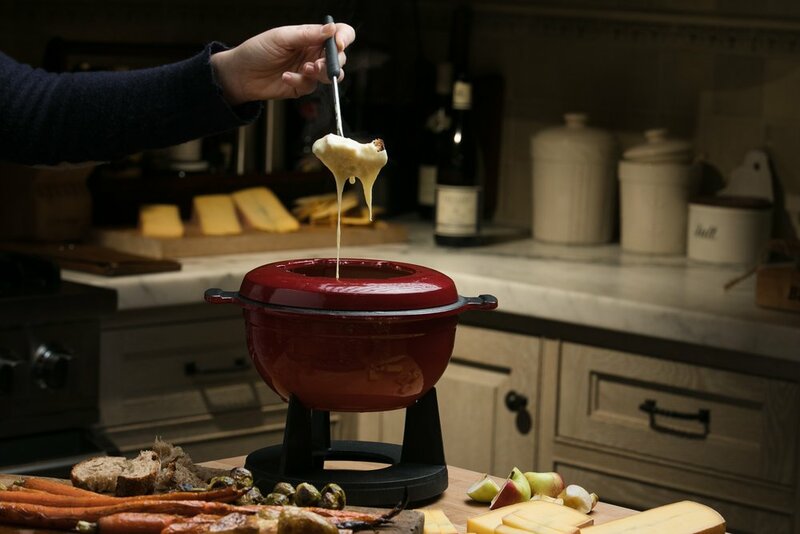 Pour white wine into fondue pot and heat on the stove over medium heat until simmering lightly. 3. Once wine is simmering, add shredded cheese a little at a time until melted and incorporated into wine. 4. Add kirsch, if using, and dry mustard. Stir to incorporate. 5. Combine lemon juice and cornstarch in a small bowl and whisk until smooth. Gradually add to cheese mixture and stir to combine. Allow fondue mixture to simmer an additional five minutes, or until smooth and at desired consistency. 6. Season with fresh nutmeg and ground pepper. 7. Transfer the fondue pot to the table and keep warm on the fondue pot warmer. 8. Serve with bread and vegetables. 1. Preheat skillet on medium low heat. 2. Apply a thin layer of mayo to one side of each slice of bread. 3. Place one slice of bread, mayo side down, in the heated skillet. 4. 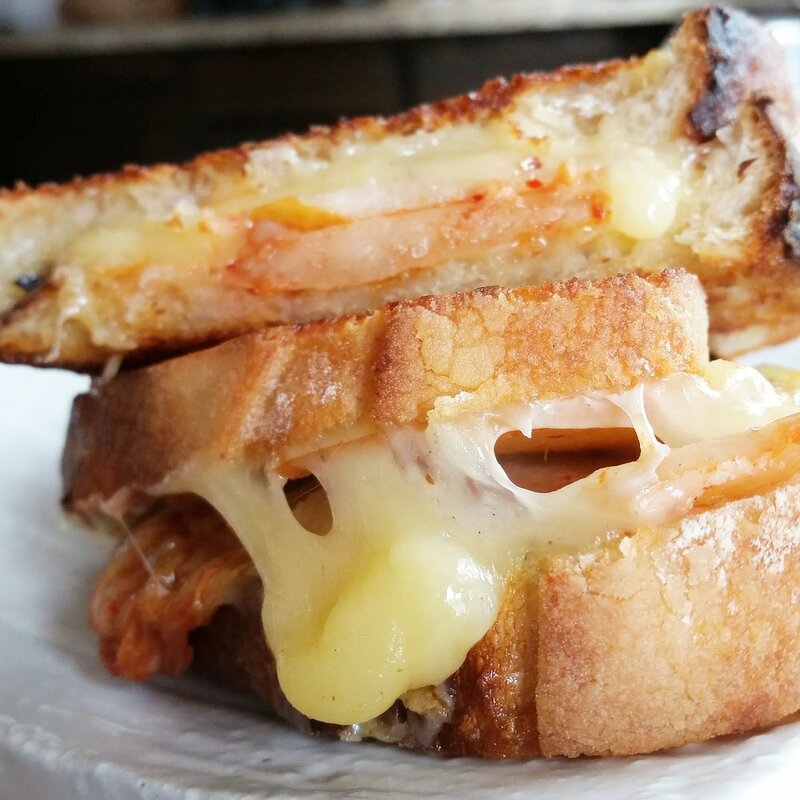 Arrange alternating layers of cheese, Asian pear, and kimchi on bread. 5. Place second slice of bread, mayo side up, on top. 6. Griddle to desired degree of crispiness and flip. Repeat on second side until cheese melted. This is a unique and fun take on the classic grilled cheese sandwich. We love the spicy sweet combination of the Asian pear and kimchi. Using mayonaise instead of butter on the outside of the bread prior to adding to the griddle amplifies the savory aspect of this sandwich... but using butter is perfectly fine as well! 1. Combine sugar, salt, baking powder, and flour in a large bowl. Whisk to incorporate. 2. Whisk together eggs and milk in a second bowl. Add to dry ingredients and whisk to combine. 3. While whisking constantly, slowly add melted butter to batter mixture and whisk to thoroughly combine. 4. Add 2 cups grated Tarentaise to waffle batter and stir. 5. Heat waffle iron. Once ready, coat with butter, oil, non-stick cooking spray (whichever is kicking around the kitchen.) Pour an appropriate of batter to waffle iron for desired waffle size. Before closing the iron, sprinkle top of batter with small amount of remaining grated Tarentaise. Cook to desired level crispiness. 6. Top with a generous dollop of maple cream (or syrup) and enjoy! * Feeling crazy? Add some cubed ham or crumbled bacon to the waffle batter!